We’re back with part 6 of Overheard in Product—a series where we round up all of the tantalizing conversations from product folks that you may have missed on the web last week. This week, we talk about including UX in your core design team from the beginning, the business case for narrow success, the problem with keeping engineers busy, and feeling emojional. Poornima Vijayashanker, Founder of Femgineer, chatted with Sarah Doody about the top 3 reasons your team should include a UX designer from the very beginning. One highlight: Sarah discusses the friction around UX inside some companies—particularly the belief that user research might slow down the product process or even negate the founding beliefs of the company. The answer? Sarah recommends switching your thought process. User research isn’t a big expense—it’s a big investment. Food for thought: What anxieties does your team have around user research? Serial entrepreneur Josh Felser planted his stake in the ground around how massive tech companies find success. Folks were widely in agreement after a clarification that narrow doesn’t mean niche. Food for thought: What’s your company’s “something narrow” that you do better than the rest? John Cutler chimed in about a human desire to be kept busy. April Wensel encouraged engineers and engineering managers to communicate and empathize with designers. Peter Merholz spoke about how easily designers get pegged as bottlenecks. And Cap Watkins explained how this phrase leads to sub-par product choices. 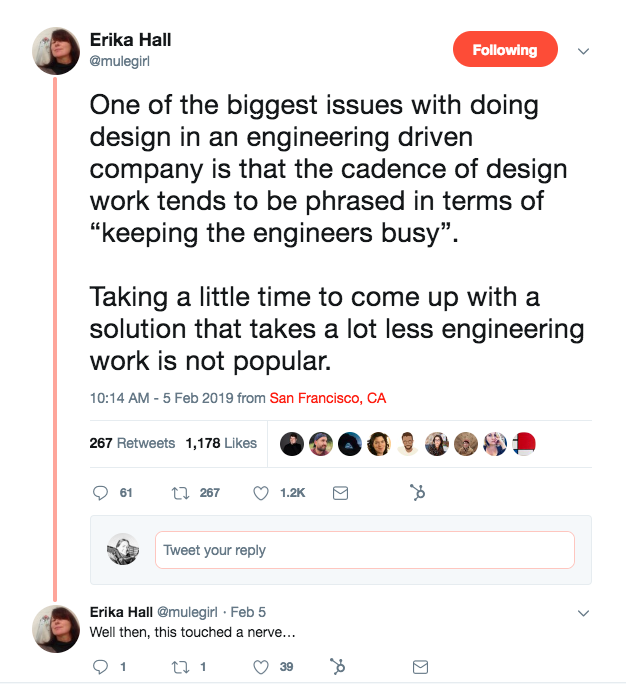 Food for thought: Does your team fall into this trap of working to keep engineers busy? Coming soon to a screen near you: a wide variety of new emojis—including an axe (to use when you’re nixing feature requests), an oyster with a pearl (for when you want to describe that nugget of inspiration you got through user testing), and a chair (since design needs a seat at the table).